My biggest problem so far is time. I have no time to go from one shop to another just to get fresh organic food, which isn't packed in tonnes of plastic, foil wraps and nets. Most of the time I have no idea if it's recyclable, and I bet you don't either. How can we?! However they come in paper/foil packaging, and we have strict rules about informing our customers what the packaging is made of. So, would you please let me know what kind of plastic foil are you using? Then I went on to contact the supplier of those foils, and when nothing happened came back to the producer of the starting product. We have contacted them last Friday, but they have not responded, would you be so kind and step in? All our products are certificated-all materials, colours. In supplement I'm sending certificate for our toys. Page 9 - there is written that packing is all right - foil packaging. Or sometimes it is: "not usually recycled" or even worse: "check your local recycling centre". And they will tell you: We recycle HDPE, but not and here you can insert your abbreviation of choice. Even if you do know what HDPE or that other thing is, most of the times the packaging simply says: "foil", or "other". So I came with this idea. It takes time, yes, but it might save your time in the long run (after all once you know what that net in which you get nectarines is, you don't have to check it every time), but also the environment. The Idea: Identify unknown plastics using home methods. Check if your foil or other plastic packaging really has resin code given. They can sometimes be given on a separate leaflet, outer paper packaging (common for breakfast oats and flakes), or on the bottom of the container (plastic bottles and cans). Follow to step 2. Take a look at the table of resin codes from Wikipedia and if you know the code search for it and look up recycling instruction. If you don't know it follow to step 3. 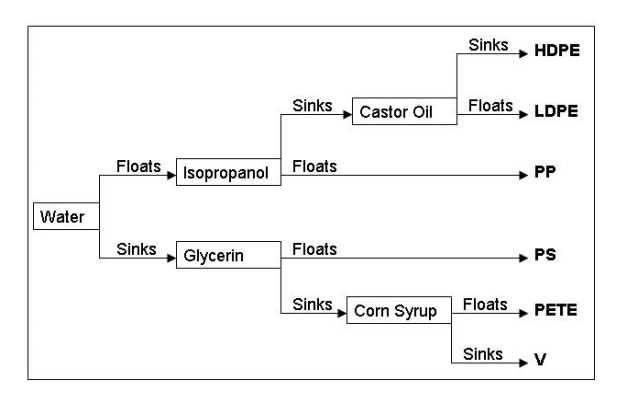 Cut a small piece of your bottle and perform a float test following this excellent and simple diagram, coming from a Density Column Using Recyclable Plastics exercise for students (click the title for details about the exercise). If your piece sinks in water, sinks in Glycerin but floats in Corn syrup it is most likely a PETE bottle. But you want to be 100% sure, and for that you can perform burn test. It is less pleasant and if you're a child I don't advise it at home or without adult supervision. Trust me, burning plastics can be way more dangerous than you think. www.boedeker.com has a great table on how to distinguish plastics based on: flame presence, flame colour, drip presence, burning odour and fumes. You can download the table from here too. You think the bottle is PETE, which is an abbreviation for: Polyethylene terephthalate, now if you look at the table you will find polyethylenes there but it will also have a remark stating that it will float. Our piece doesn't! That's why you have to check floating first, because plastics can have different densities. So your plastic could still be PETE, but simply a high density one. Check the flame and bubbling when buring and that's a good indicator. Although the smell of the flame or burnt plastic is an identifying factor I advise you don't do it. Many plastics (especially vinyls) are very harmful to us if inhaled! Which is more environmentally friendly—a cup made from corn, plastic, or glass?